Featuring a sleeker design and far better specifications across the board, the Nexus 7 (2013), manufactured once again by Asus, is a great follow up to it’s predecessor, the first gen Nexus 7. As always, Google followed its high-end specifications at a reasonably low price policy with its latest 7-inch tablet offering, the Nexus 7 (2013) can easily be recommended as a must buy. Of course, you’ll need the right accessories to help you get the most out of your device, and that’s where we come in. Today, we take a look at some of the best accessories for the Nexus 7 (2013). If you are looking for a case, checkout our best nexus 7 (2013) cases list. MoKo Slim-Fit Stand Cover Case is made from a premium PU leather exterior and microfiber interior, along with a padded front cover and hard plastic back, for complete for great overall protection, including corners. Closing and opening the front cover automatically wakes or puts the device to sleep. The built-in stand is adjustable to several angles, depending on your requirement, and the case includes a hand strap at the back to hold the tablet and minimize the chance of an accidental drop. The MoKo case is stylish, and includes numerous color options. Buy now on Amazon for $14.99. The rugged Trident Aegis Case meets military standards for vibration and drop (26 drops on concrete from 4 feet) tests, and features a silicone skin with double-thick silicone corners, along with anti-skid pads, to protect your tablet from bumps and shock. A sleek hardened-polycarbonate outer frame provides even more protection. The charging port and headphone jack are covered with silicone plugs, keeping dirt and debris out, and the case features high-quality dust filters prevent dust particles from entering the tablet. The case features a protective bezel around the front of the device to prevent damage from face down drops, with the package also including a screen protector. Buy now on Amazon for $39.24. The Bear Motion Premium Folio Case is made using a durable PU leather material, and is elegant looking, while also protecting the tablet well. It is easy to pair the magnetic detachable bluetooth keyboard with the device, and is light-weight, yet sized reasonably well and has good tactile feedback. The case features all the proper cutouts for access to the camera, power button, volume rocker, and ports, and also features a sturdy kickstand. Buy now on Amazon for $23.99. The EnGive PU Leather Case, as the name suggests, features a PU leather material that is comfortable to hold, and offers all-round protection for your device. The magnetic detachable keyboard features a built-in 500 mAh battery, and includes special function keys to lock the device, put it in sleep mode, start a slideshow, return to home, and more. The case has precise cutouts for easy access to all buttons and ports, and also features a kickstand. Buy now on Amazon for $29.99. The amFilm Clear HD screen protectors doesn’t distort the natural colors or high resolution display of your Nexus 7 (2013), and protects your screen from daily scratches, dust, and scrapes. With a self-adhering surface, the film is designed for easy installation and zero-to-minimal bubbles during application. The package also includes a squeeze card to remove the occasional bubble easily, and microfiber cleaning cloth. The amFilm screen guards also come with lifetime replacements. Buy now on Amazon for $6.95. The iSmooth Ultra Clear HD screen protectors are made from the highest quality Japanese PET film, and promises clear and long lasting screen protection, with the additional benefit of lifetime replacements. Installation is very easy and usually bubble free. The package comes with a premium microfiber cleaning cloth, four dust removal stickers, installation tips with a video, and two ultra clear HD screen protectors. Buy now on Amazon $8.97. The Nexus Wireless Charger features a more understated design compared to the Nexus Wireless Charging Orb and includes magnets to lock in your device in the optimal charging position. This Wireless Charger is easy to set up and use, and features a special base grip to firmly adhere to any surface. The Nexus Wireless Charger is compatible with the Nexus 4 and Nexus 7 (2013), and likely other Qi-standard compatible devices as well. Buy now on Amazon for $49.99. The RAVPower Wireless Charging Pad features a sleek, light-weight design, and is compatible with any Qi-enabled device. An LED charging indicator shows you the charge status of your device, and the charging pad automatically goes into idle mode when the device is fully charged, or moved from the pad. The grey ring at the center of the charging pad prevents the phone from slipping. It also works with most protective cases, that are less than 5 mm in thickness. Buy now on Amazon for $39.99. 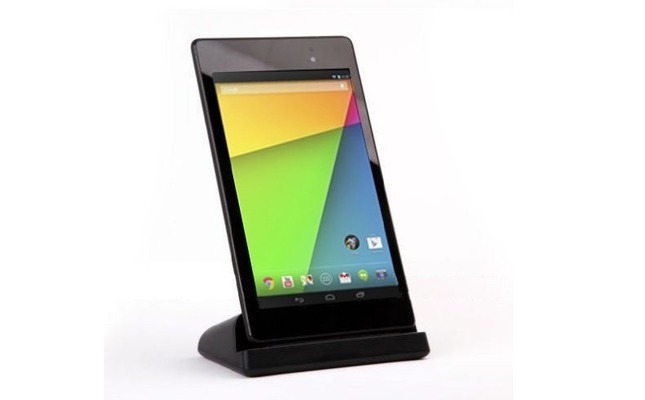 Because of the position of the charging port, most docks for the Nexus 7 (2013) hold the device in the portrait orientation. With the KiDiGi Wireless Charging Dock, that issue is taken care of, with the dock featuring wireless charging while the tablet is docked in landscape mode. The dock features an edge-to-edge design such that the device doesn’t slide around while docked, and with the landscape orientation, is ideally suited for media-viewing. Buy now on Amazon for $63.90. The InventCase dock is specifically made for the Nexus 7 (2013) and features an excellent desktop viewing angle (in portrait orientation) and super fast charging. You can also sync your tablet with your PC or laptop while it is charging. The dock also includes and LED indicator for when the stand is in use. Buy now on Amazon for $15.00. The Klipsch S4A 2 earbuds are a good all in one solution to give you full control of your Nexus 7. They come packed with a microphone, volume controls, play/pause and the ability to scroll through songs forward and backwards. These earbuds also feature a natural noise isolating capabilities that will block out any outside sound. Buy now on Amazon for $74.99. The Google Chromecast HDMI Streaming media Player lets you stream your online video and music to your TV from your smartphone, tablet, or laptop, with support for Android and iOS devices and Chrome for Mac and Windows. Setup is very easy, with all you needing to do is plug the device into the HDMI port of the TV and connecting to the Wi-Fi network. Support is somewhat limited currently, with support for Netflix, YouTube, HBO GO, Hulu Plus, Pandora, Google Play Movies, and some music apps through Chrome available for now. Buy now on Amazon for $35.